Edward Dwurnik (b. 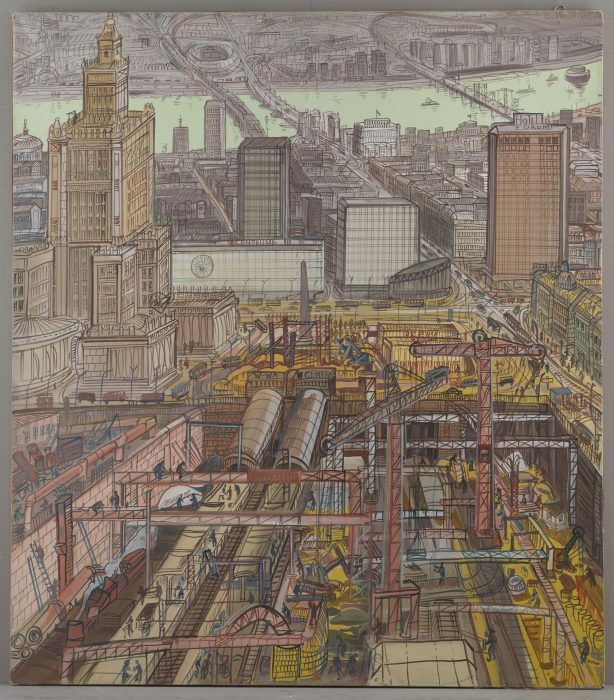 1943) gained renown with his bird’s eye view cityscapes and multi-figured compositions that provide an ironic portrait of the rough existence in People’s Poland (1944–1989). Many of them can be viewed as journalistic or symbolic works. The presented painting, which originates from the cycle Warsaw, was created for the 5th Festival of Fine Arts – Warsaw 1974, organised by the Central Office of Artistic Exhibitions and the Warsaw branch of the Association of Polish Artists and Designers. It was exhibited at the festival exhibition at the Zachęta National Gallery of Art under the title Two Construction Sites (the rear of the painting has preserved stickers from the exhibition). After the festival, the work was purchased by the Art and Culture Department of the City of Warsaw and donated to the Museum the following year. The painting is in good condition and has not required preservation. Maintained in the artist’s characteristic graphic style, inspired by the work of Nikifor Krynicki (1895–1968), well-known Polish primitive painter, the view is akin to a reportage. It affords a bird’s eye perspective of central Warsaw in 1974. The artist recalls that it was inspired by numerous infrastructural projects pursued at the time in Warsaw. The Central Railway Station, the largest railway station of the capital city – beside the rebuilding of the Royal Castle and the construction of Łazienkowska Route, connecting the city centre with the part of Warsaw on the right bank of the Vistula River – was one of the most spectacular. The work betrays fascination with modern city and its infrastructure. Visible in the foreground is the construction of the Central Railway Station, depicted at the stage of building underground tunnels and platforms. Painted behind it is the panorama of the capital city with the Palace of Culture and Science, the commercial and office buildings of the so-called Eastern Wall, the Modernist architectural-urban complex raised in the 1960s, along Marszałkowska Street and the Forum hotel. Marked with dynamic lines, main thoroughfares run across the Vistula River on three bridges: Cross-City Railway Bridge, Poniatowski Bridge and Łazienkowski Bridge, the latter under construction as part of the Łazienkowska Route. The Central Railway Station and the Łazienkowska Route (1971–1974) became the seminal transport infrastructure projects of the 1970s in Warsaw. The functional, aesthetic and modern edifice of the Central Railway Station (1972–1975) was designed by Arseniusz Romanowicz (1910–2008) in collaboration with Piotr Szymaniak (1911–1967). The entire railway infrastructure was hidden underground. Despite the financial problems with which the country grappled, the project received generous funding. The builders strove to use the best materials available, the corridor walls were clad with white marble, part of the equipment was imported from the West, such as the automatic doors (first in Poland) from Switzerland and escalators from France. The Łazienkowska Route was built as a modern express way – the ring road of the city centre, which facilitated transport along the east-west axis. As much as they were extremely needed, both projects were also perfectly harnessed by the authorities in their success propaganda which served to confirm the effectiveness and rightfulness of the Socialist regime and economy.